Saddleridge Slopeside Retreat is the perfect Big Sky ski-in/ski-out condo! 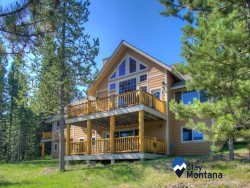 This well appointed 3 bedroom condo is awaiting you for your next Big Sky Escape! Located within the Moonlight base area is the Saddleridge ski-in/ski-out condo complex and it is the perfect blend of convenience and value. After a day of adventure you can relax in the private hot tub and take in the amazing views of Big Sky Resort. This property has the option for guests to access the Moonlight Basin amenities for an additional fee. The Moonlight lodge amenities include access to breakfast, lunch, & dinner at the Tavern, pool & hot tub, fitness center, and retail shop. Outfitters at Ulery's Lake has activities like nordic & snowshoe equipment, fat tire bikes, snow tubing, ice skating, and hockey. - Electric Range,Coffee Maker, Toaster, Crock Pot, Blender, Roasting Pan, Bakeware, 8 Place Settings, Basic Spices, Trash Bags, Dish Soap, Dishwasher Soap, Sponge, and Paper Towels.